This Blueberry Peach Coffee Cake is a luscious cake that is sure to be a crowd pleaser. Made with olive oil and kefir, this simple cake is moist, tender and so light. It is screaming summertime with the peaches and blueberries on the top. Looking for an easy fruit cake that you can impress all your friends with? Look no further! 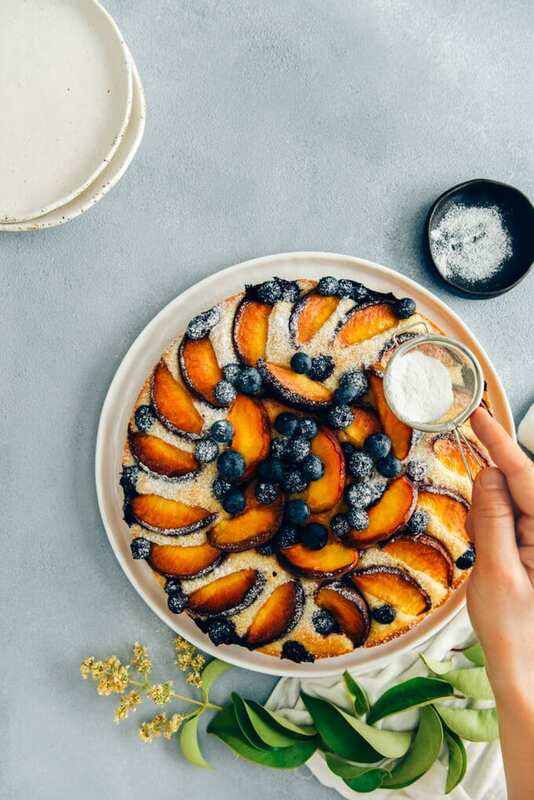 Make this peach coffee cake in a springform pan, top with extra peaches and blueberries towards the end of the baking. Voila! You have the most fascinating summer cake ever! You don’t even need a glaze as the top is already wonderfully moist thanks to the peaches and blueberries. I use a 9×3-inch springform pan for this cake because I find it easier to release the cake from it. You can use any shape of cake pan you have. Just make sure the amount of the cake batter fits the pan well. Use a cooking spray or butter to grease the side and the bottom of the pan and line it with parchment paper. I grease the parchment paper too so that I can easily remove the parchment paper and transfer the cake on to a serving plate or a cake stand. I make this peach coffee cake with fresh peaches because we are in season, but you can make this cake all year round using canned peaches too. Make sure you drain the canned peaches well before placing them on the batter. It is even better if you wait them on paper towel while you are preparing the cake batter. I place the peaches and blueberries in two steps. First, directly on the batter in the pan before baking. Then I put a few more peach slices and blueberries in the middle of baking so that they keep their shape and color. This second step is totally optional. Although my family loves kefir on its own, I do love to create recipes with it. If you are following our blog for a while, you know so well that I love to use kefir in my baking. The Glazed Lemon Zucchini Bread with kefir I shared on the blog last year was amazing and it’s still one of our readers’ favorites. Kefir is a great ingredient to help this cake get moist with a slight tangy flavor. In addition, you don’t need to use a lot of butter in this recipe thanks to kefir. Well, I don’t use any butter at all. Just 1/3 cup of olive oil was enough. Don’t worry, you won’t feel the taste of olive oil in the cake. If you want to include kefir in your diet, using it in a cake like this would be a great start. Blackberry Fig Kefir Smoothie – We love it as breakfast or afternoon snack on really hot days when we don’t feel like eating anything. Kefir Lemon Bread – This is like lemon ice cream in the cake form. So good for summer! 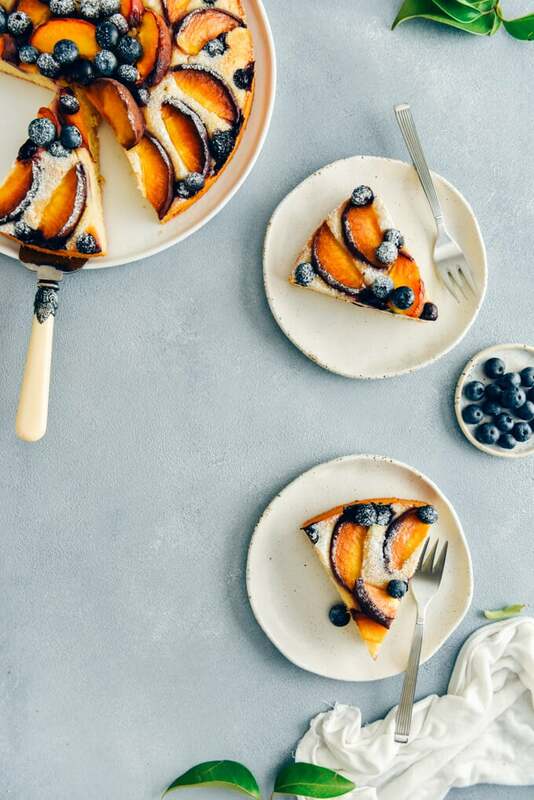 Persimmon Kefir Tart – You will be amazed by the kefir tart filling in this recipe. You can just substitute persimmon with any summer fruit you like if you are planning to make it these days. Peach Bread with Walnuts – If you are in the mood for a loaf loaded with peach chunks, give this recipe a try. 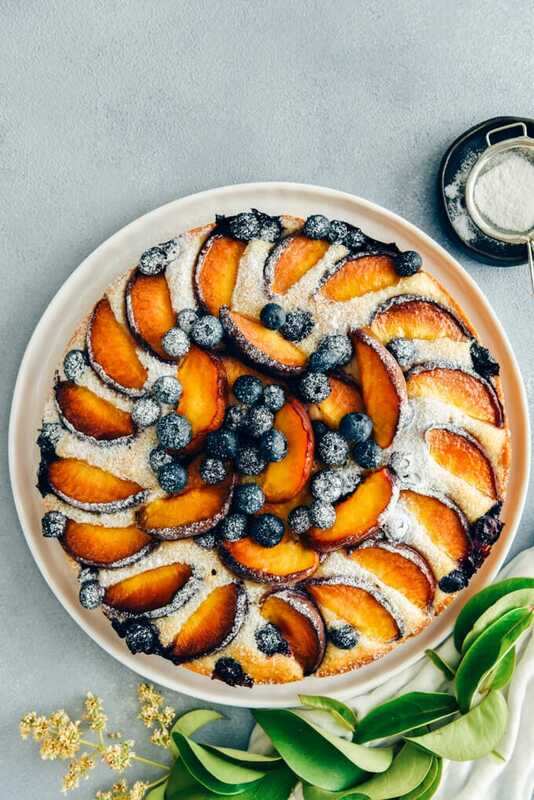 If you have a chance to make this Blueberry Peach Coffee Cake recipe, I’d love to hear your feedback. Please rate the recipe and leave a comment below. Butter the bottom and the sides of a 9×3-inch springform cake pan or use cooking spray. Line it with parchment paper and butter it too. Mix eggs and sugar with an electric mixer until creamy. Add in olive oil, kefir and vanilla extract and mix well. Pour the dry mixture into the wet mixture gradually and stir with a spatula just until combined. Don’t overmix it. Pour the batter into the prepared pan. Place peach slices in a circular shape and scatter blueberries between peach slices. Sprinkle granulated sugar over the fruit. Leave a few peach slices and some blueberries for the second topping during baking. Bake the cake for 35 minutes. Remove from the oven, place extra peach slices and blueberries (optional) and put it back to the oven. Bake until golden or a toothpick inserted in the center comes out clean or with a little crumbs, about 15 minutes, 50 minutes in total. Let it completely cool down in the pan. Release it from the pan and slide the cake onto a cake stand or plate. Dust with powdered sugar when serving. Keep the leftovers wrapped in the refrigerator for up to 3 days. It tastes still good on the third day, but I don’t think it stays that long. I’ve never tried the taste of peach mixing with coffee, it must be distinctive! Hi Natlie! Well, there is no coffee in the cake. This cake is mostly served with coffee, that’s why it is called coffee cake. Thank you Sue! Much appreciated! Could you please give me the link for the orange cake recipe, that was before this recipe. Hi Idtis! Sorry, I don’t understand which recipe you are talking about.